If you’ve looked at the KRG website, you’ll see that they have the following chassis available: Bravo Chassis, Whiskey-3 Chassis, X-Ray Chassis, 180-Alpha Chassis, 180-Xray Chassis, Whiskey-3 Lefty Rem 700SA, and X-Ray Lefty Rem 700SA. Each chassis has their own individual specifications and modularities, but one thing can be promised: each chassis available on the KRG website will be one of the most comfortable chassis you’ll ever use! One of the key considerations people make when choosing a firearm is comfort. Shooters everywhere prefer firearms that fit with their body and meet certain specifications that make shooting for them a more enjoyable experience. The last thing any shooter wants is to go to a shooting range or to go hunting and find out that their firearm doesn’t fit snug against their shoulder or their experience isn’t as good as it could be because of difficulty handling certain parts of their firearm. However, by purchasing your chassis from KRG, there is no need to worry about having limited customization options for your firearm. KRG has the chassis any shooter could want for the kind of shooting experience they can brag about. When shooting, it is known that guns can get heated. With rapid use of a firearm and a quick succession of shooting over and over again, firearms are known to heat up causing issues with firing and creating a problem for the shooter. 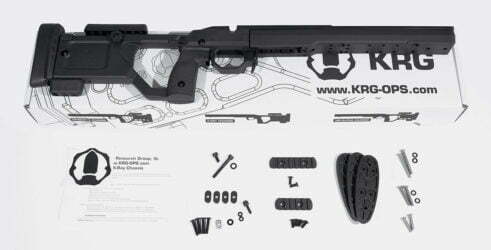 With KRG chassis, however, most parts that are handled by the shooter are made of polymer. Making parts of their chassis with polymer protects the shooter from heat or cold transfer, especially when shooting in extreme weather conditions. So, whether you’re hunting for moose in the frigid temperatures of Alaska or hunting for wild turkey in Arizona, you can be sure that KRG’s chassis won’t burn your skin and interrupt your experience! In addition to this, KRG chassis offer an adjustable length of pull, cheek piece height, but pad height, and cant. Now, if you’re an avid shooter, you know how important this can be. People aren’t made to be the same size. Everyone is different in height, arm length, leg length, neck length, and more. With all of these different sizes, gun makers everywhere need to keep in mind that every gun won’t fit every person. Most gun manufacturers, however, do not keep this in mind when making guns. But, your silent wishes for adjustability have been answered! KRG offers chassis with adjustability so that each shooter can pick the most comfortable chassis for them! As avid shooters themselves, each KRG member has a passion for designing chassis that everyone will love! Their grips are designed in-house so that each individual can achieve the best fit and most comfortable placement of the firing hand. KRG knows how stressful it can be to have to adjust their own bodies to fit the gun they are shooting with. That is why they set out on a mission to design their own line of chassis that meet all of the requirements a shooter needs. They even have options available for left-handed shooters because, when it comes to shooting, you want to be accurate and comfortable. If this sounds like a company you’d want to purchase your chassis from, head on over to their website and select a chassis that speaks to you! Or, contact them today, explain exactly what it is you need, and let them help you find the most comfortable chassis they know you won’t regret investing in! With their knowledge and expertise, you’ll never have a bad experience shooting.